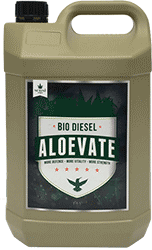 Bio Diesel Aloevate is a plant health tonic which helps to protect the plant's root zone and break down any dead roots or unused mineral salts. It's made from a blend of plant extracts and contains hundreds of vitamins an enzymes. Aloevate can improve plants size, vitality and overall growth rates while offering protection from disease. 2ml per litre of nutrient solution during the Grow stage. 5ml per litre during the bloom stage. Foliar Spray - a powerful organic chelating agent and wetting agent helps to carry minerals and vitamins directly to the plant - where it's needed - quickly. 5ml per litre weekly at night - with good air circulation. It is recommended to stop foliar spraying after the 4th week of bloom.